Arlene Croce. Critic from The Past is Prologue. The Australian Ballet presents the premiere of a version of Swan Lake by resident choreographer Stephen Baynes. It takes a certain combination of maturity and creative vision to choreograph a version of the hyperbole that is Swan Lake. Over decades we have witnessed Baynes’ creative vision in his new works for the Australian Ballet. Baynes has created masterpieces of symbolism with dazzling, daring do, swooping twists and languid bodies tying in knots that then unravel. He is an expert at choreographing from the score. We hear new things in the music watching Baynes’ interpretation of classical scores. Taking on Tchaikovsky seems like it would be possible for few other than Baynes, and it’s not his first full length creation on The Australian Ballet, so he has maturity as a choreographer. Nevertheless, this production of Swan Lake lacked the audacity necessary to reinvent a classic for a contemporary context. In the program notes Baynes states that it was his intention to create a new version of a traditional production of Swan Lake that would offer an alternative in the repertoire to The Australian Ballet’s Graeme Murphy production. Leaving aside the fact that to create a new version that is a traditional production is oxymoronic, Baynes states there was no question that the Act 2 choreography should remain as the original Marius Petipa work. And yet, he does not go on to say why some choreography should remain the same and not other sections. Certainly the Petipa choreography is iconic; the first entrance of the white swan is inscribed in ballet goers’ imaginations, audiences love the sublime order of the corps de ballet in Act 2, the great exultation of the Act 2 pas de deux, the virtuosity of the Act 3 pas de deux, and the tragic conclusion of great romantic love in Act 4. But why bother remaking any of it, if not all of it? It is the court scenes of Act 1 and 3 in which Baynes has sought his most substantial revisions and created new choreography. Here Baynes’ trademark lyricism injected into the court scenes doesn’t allow a juxtaposition between the dispassion of the court and the lyricism of the swans. The traditional choreography mostly sits awkwardly with Baynes’ revisions, neither illuminating the other, but making both uncomfortable bedfellows. The fourth act provided glimpses of what might have taken flight had a greater risk been taken. In Act 4 Baynes choreographed the swans at length, rarely referring to the Petipa choreography. Here in the yearning of the swans against the will of von Rothbart we saw Baynes begin to transcend previous productions. Briefly the traditional story is that of a woman, Odette, who has a spell cast on her by the villain von Rothbart, to remain a swan unless someone vows to marry her for her. Siegfried falls in love with the swan woman Odette, but is deceived into declaring his love for another, von Rothbart’s daughter Odile, so Odette is condemned to life as a swan, or death. Baynes’ Swan Lake opens (sadly without an overture; the discarding of a convention that provides for the audience a bridge to the other world) with the Prince having a memory of unhappiness in childhood over the death of his father. This production attempts narratives of psychological realism for the characters of the Prince and his Mother. The unhappy fate of Prince Siegfried remains a theme across the ballet. Baynes returns to Siegfried’s fate, rather than Odette’s fate, as a central narrative thread. In Baynes’ production, von Rothbart’s entrance with Odile is re-imagined as the entrance into the court of a gang of gothic new romantics, ready to seduce and deceive the Prince into declaring his love for one other than Odette. Baynes has shifted the divertissement Spanish dancers in Act 3 to become gypsies in Von Rothbart’s company. In a somewhat strange addition the Queen is also seduced by exotics from von Rothbart’s consort. But when von Rothbart mimes playing the violin as part of the mechanisms of seduction, the action becomes comic. If the love story and tragedy of Siegfried and Odette is to be felt by the audience, it requires a real villain, not a parody. And so these narrative turns run into trouble. Siegfried, Odette and Odile, and the Queen are epic heroes, and Swan Lake is an archetypal fairytale, a myth which lives in symbolism, not in the domain of realism. Attempts to infuse it with realism only reveal the insubstantiality of the story. 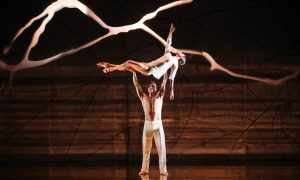 The performances by The Australian Ballet dancers on the evening of the 19th of September proved their technique. Notable dancers were Lisa Bolte as the Queen Mother and Chengwo Guo as Benno, who both interpreted their roles with artistry and intelligence. This production of Swan Lake by The Australian Ballet is a re-staging rather than a display of new choreography, a remix rather than a reinvention. Of course there is no one true Swan Lake possible, there are only ever versions. This version attempts to find new narratives within the fairytale, without enough interrogation of their thought line. The residual question is what prompted Baynes to work with the material of Swan Lake, leaving so many sequences untouched, cobbling together an unfulfilled patchwork, when he could be creating entirely original masterpieces? Of course the box office generated by presenting a traditional Swan Lake, over a new work, is a likely consideration.